Give a friendly Beast +2 Attack and Immune this turn. I like this card now. 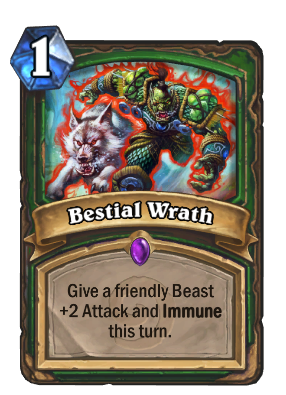 With Un'Goro bringing in so many beasts, this becomes a better Abusive Sergeant where you can keep the original beast instead of a 1/1. Even if the beast you keep is an Alleycat or something, it's still strictly better due to beast synergy. It can also combine well with the various poisonous beasts like Giant Wasp. Is this card really that bad? It's really good for maintaining board control, which hunters desperately need to keep. I have two of them in my current hunter deck, and I'm almost never sorry to see them in my hand, unless I've just been completely cleaned off the board. Even then, used with charge minions, you can get back on the board with it. The synergy with GIANT SANDWORM is the DREAM! If Hunter had any form of card draw, this card would actually be awesome. The tempo you gain at the loss of card advantage just isn't worth it. This card is really good in mid range hunter. It helps you trade so efficiently. It helps to maximize your mama usage when playing off curve. This is great when you drop animal companion and get the 4/2 with charge. 6/2 immune melts enemy taunts. Make that web spinner they left alone get extra value. Take out an emporer cobra with no ill effect. Make call the hounds a tad more efficient. "Until the Start of your Next Turn?" I don't think that's a good idea. Turn 8, you play Gahz'rilla into this. Then you owl any enemy taunts and unload direct damage onto Gahz'Rilla the turn after for a hard-to-stop lethal. Got a golden one. Free 400 dust. In addition to this, if it is cast on an opposing beast with taunt, you are no longer forced to attack that minion. Similar to the way stealth works on minions with taunt. Really? Is that even possible? The text says you can only cast it on a friendly beast and the effect is gone after your turn is over. The word '"friendly" was added in December. so when he posted it was still a thing, but apparently unintended by blizzard. it basically ruined houndmaster's effect.